After more than 9,000 years of lying dormant, Chaitén Volcano in southern Chile began erupting on May 2, 2008, blanketing the town of Chaitén, 10 kilometers away, with ash and forcing the town’s 4,000 people to evacuate by boat. 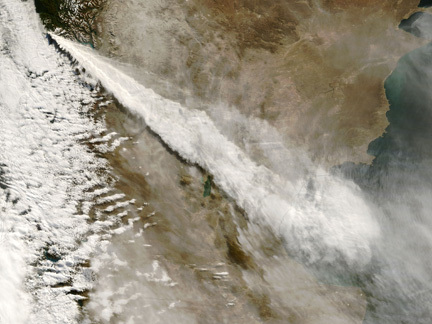 Southern Chile's Chaitén Volcano continued to step up its activity on Tuesday. After three days of erupting thick clouds of hot white ash, officials warned that the volcano had begun spewing lava. That increase in activity has prompted the evacuation of two nearby towns. After increased seismicity heralded the impending eruption, Chaitén Volcano began ejecting clouds of hot ash more than 16 kilometers into the sky on May 2, according to the Smithsonian Institution’s Global Volcanism Program (GVP). The ash drifted to the north and southeast, falling hundreds of kilometers away and polluting the air and water supply. “The volcano is exploding,” Chile’s president, Michelle Bachelet, said May 6 during a speech in the capital city of Santiago, according to CNN. As the eruption intensified, officials warned that the region was at risk from both lava and pyroclastic flows, and ordered any remaining people, including emergency officials and press, to leave the area. More than 4,000 people had left the town of Chaitén following the initial eruption, while hundreds more are waiting to leave, according to a May 6 report by the BBC. One elderly woman died of a heart attack on board a Navy boat as she was evacuated from Chaitén. Another town 70 kilometers to the east on Chile’s border with Argentina, Futaleufu, was also evacuated. The newest phase of the eruption included pyroclastic material that puts the eruption “on a different scale,” said Rodrigo Rojas of Chile’s National Emergency Office, according to the BBC. Pyroclastic flows are highly destructive, dense mixtures of extremely hot fragments of rock and gases that move at high speeds, and generally include both a flow of fragments along the ground and a turbulent cloud of ash above. At more than 1,100 meters tall, the volcano towers over the town of Chaitén, 10 kilometers away, on the Gulf of Corcovado. Chile sits on the border between two converging tectonic plates — where the oceanic Nazca Plate is sliding underneath the South American Plate — and has the second most active volcanoes after Indonesia, with about 100 of Chile's more than 2,000 volcanoes listed as active, according to the GVP. Chaitén, however, has lain dormant for more than 9,400 years, with the last known eruption in 7420 B.C. The volcano’s caldera dates to the Pleistocene (about 1.8 million to 12,000 years ago), and contains a lava dome that formed much more recently, within the Holocene (about 12,000 years ago to the present). The dome is formed of rhyolite, a highly viscous magma that is often associated with energetic and explosive eruptions, according to SERANGEOMIN, the Chilean National Geological Survey. Previous deposits of lava and pyroclastic material suggest that thousands of years ago, the volcano had an explosive history. Although it is not clear why Chaitén Volcano awoke after its long sleep, the dormant period could have been much longer, says Rick Wunderman, a volcanologist at the GVP. "It could be half a million years. Ten thousand years is like a drop in the bucket." Geologically, the setting is somewhat similar to the northwestern United States, Wunderman says. Like Crater Lake in Oregon, beneath Chaitén there is likely a huge chamber full of slowly cooling magma — like a holding tank at depth. Magma in these chambers might take half a million years to cool, and in some cases might never erupt at all, or might erupt dozens of times. "It's often quite a complex system, that evolves and squirts out little and big eruptions," he says. But what causes those eruptions, he adds, is still a "controversial question."